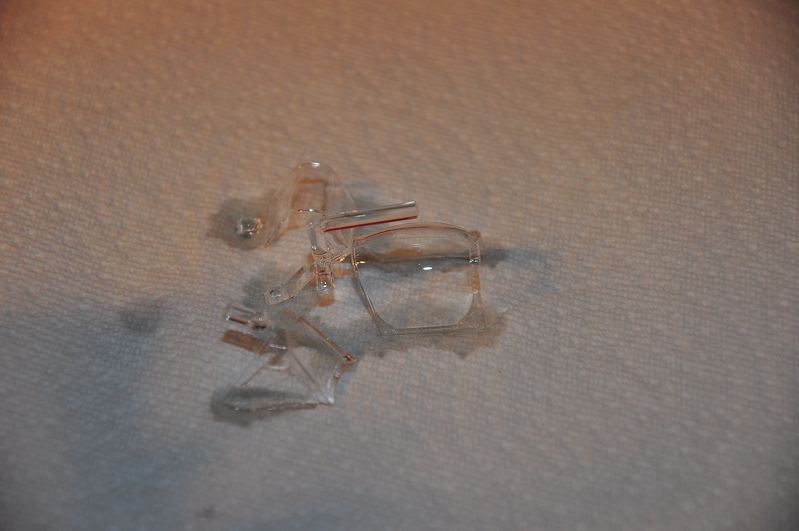 Ok – I've just received a nice set of closeup lenses (the screw on filter type) for my camera. 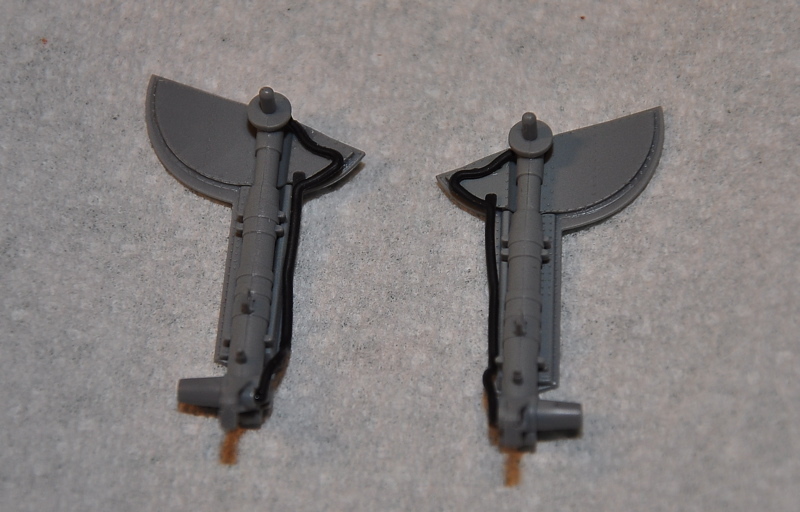 This is the first pics with them. 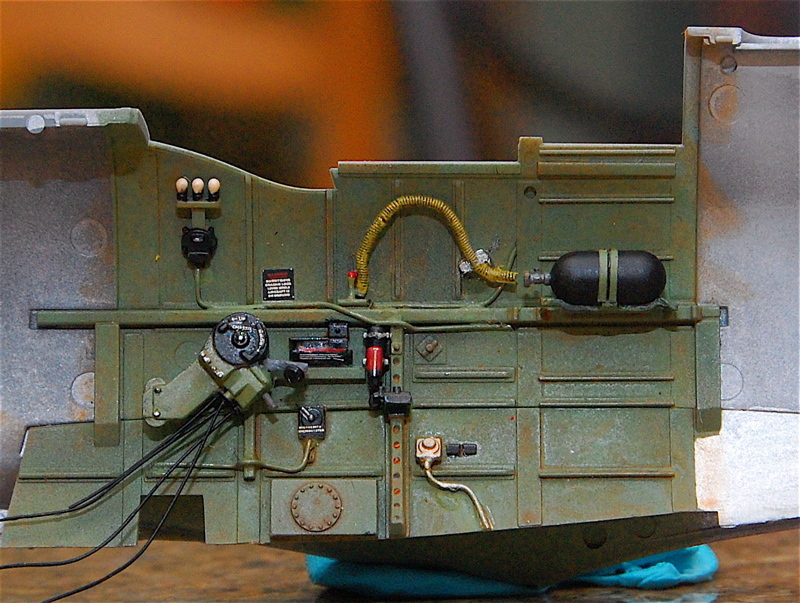 The first one is the control panel close up. 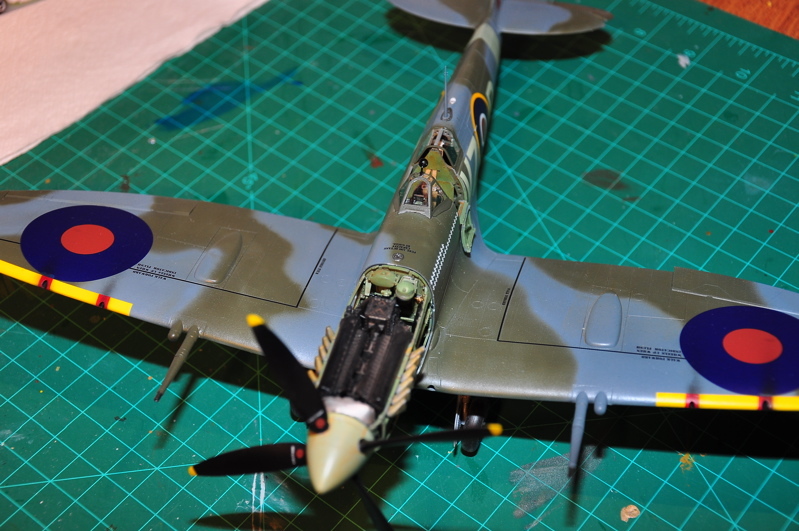 I've added 18 extra decals which include the black backing decals which go on first. 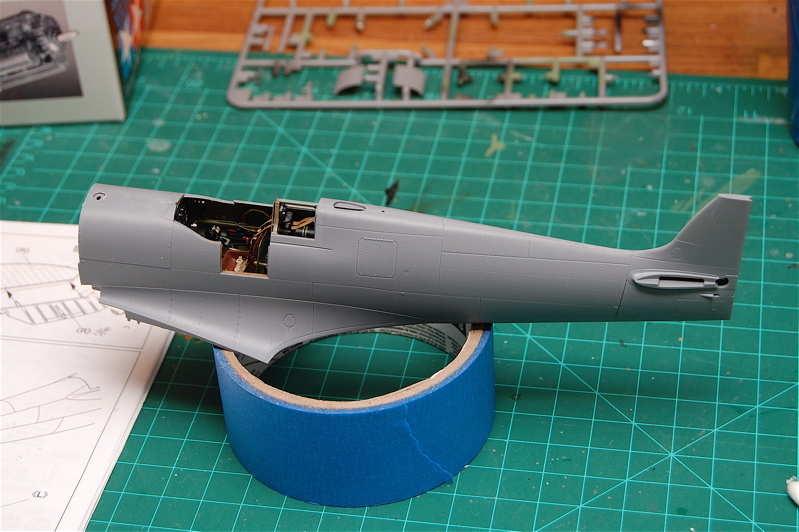 This stuff is all from BarracudaCast and are really great. 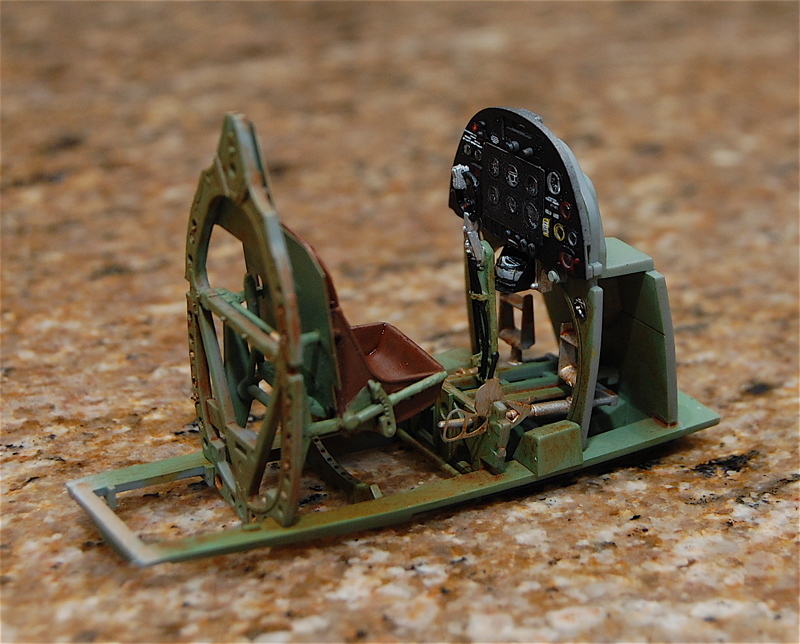 The set also includes the control stick and the gear retract and throttle guadrants as well as decals for them along with a lot of other bits. 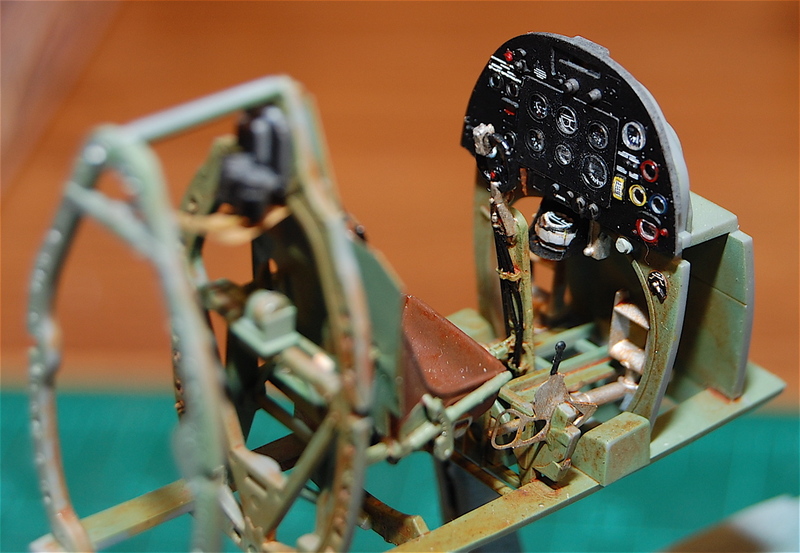 This really enhances the already fantastic cockpit. 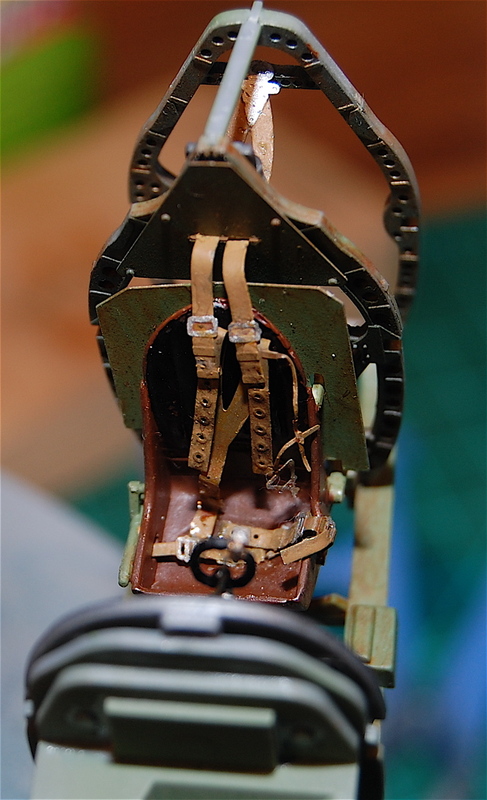 The second picture is the partially finished cockpit showing the resin seat. 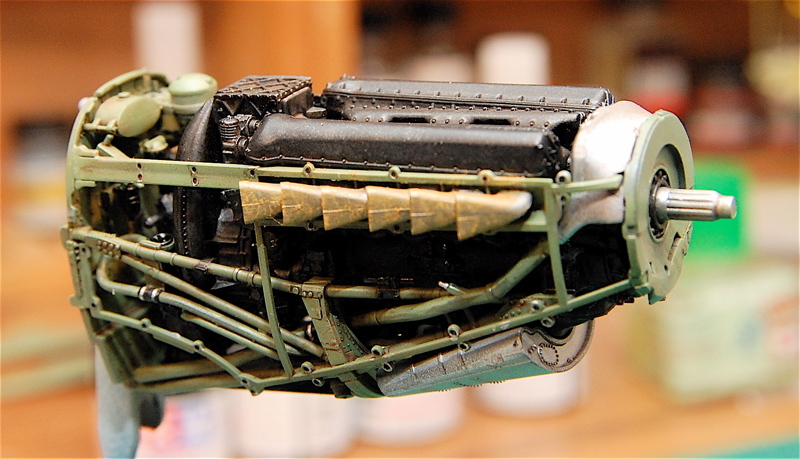 I've done a oil wash to show some wear and tear. 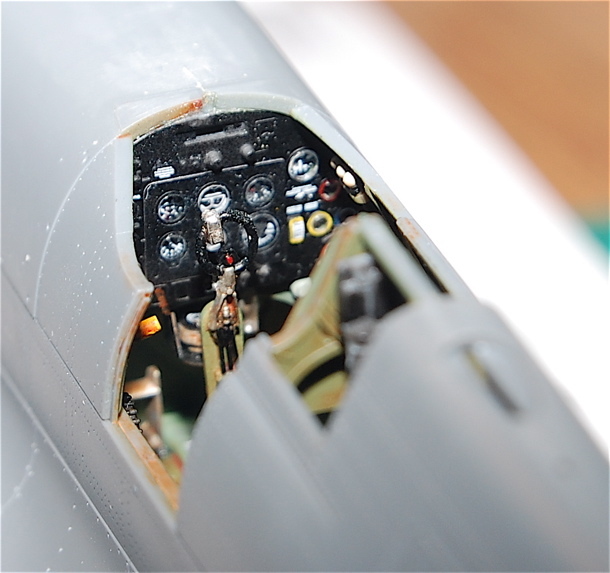 Below are pictures of the cockpit sidewalls. 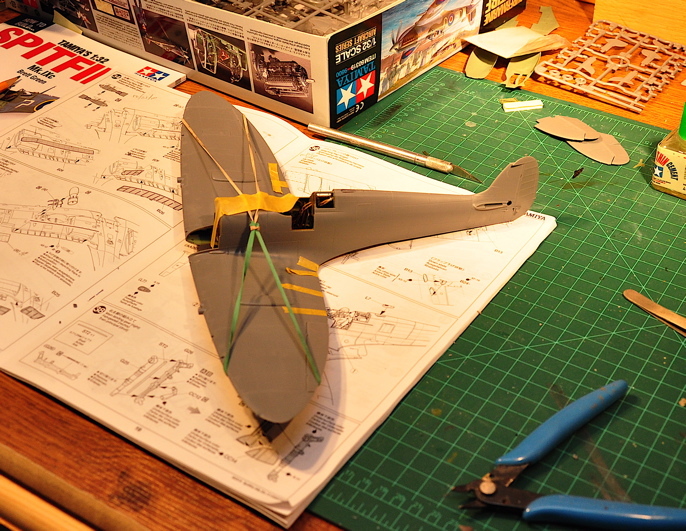 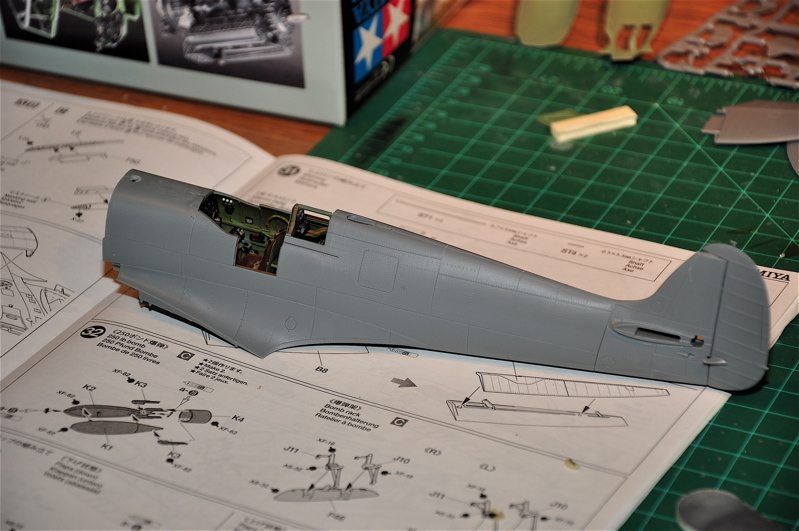 Normally you glue the sidewalls to the control panel – seat assembly, but I wanted to add some extra wiring to the sidewalls – this necessitated gluing them to the fuselage sides instead of the seat structure. 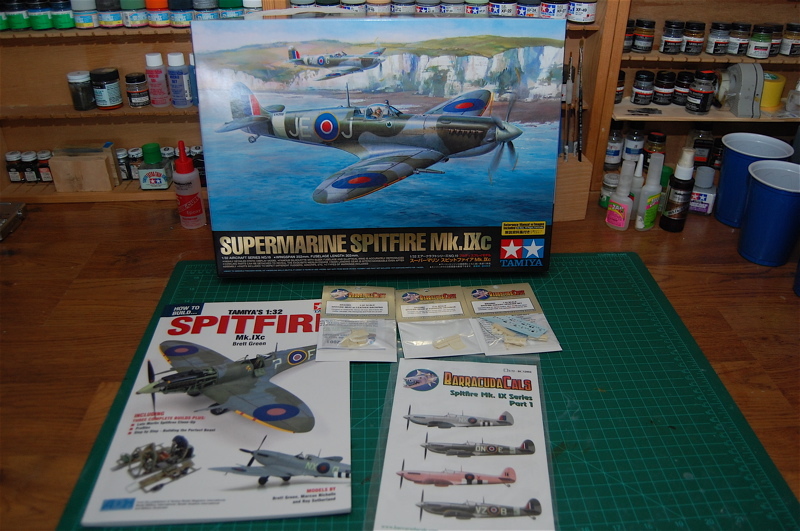 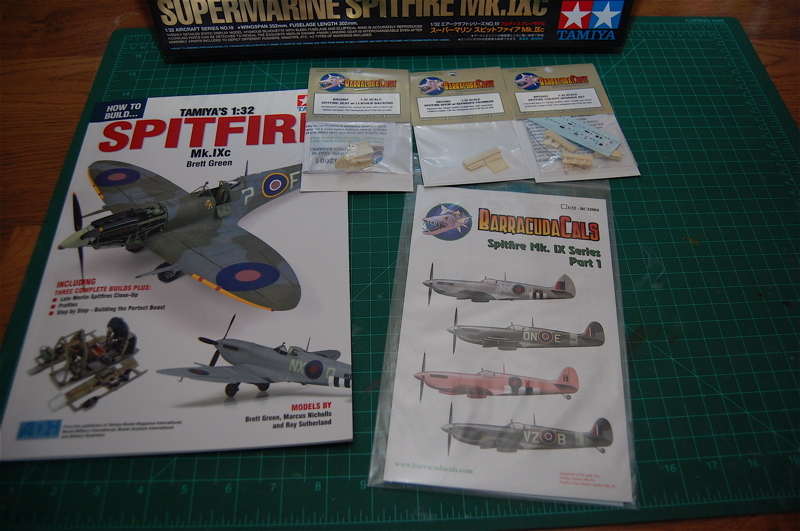 I used as a reference the nice pictures that came with the BarracudaCast cockpit set as well as the Tamiya book on assembling the 1/32 Spitfire. 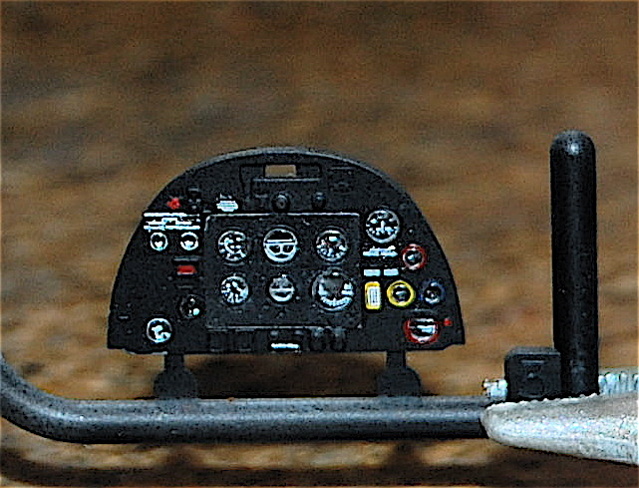 The cockpit set also included a great set of decals to enhance the cockpit – you can notice many of them on the sidewalls. 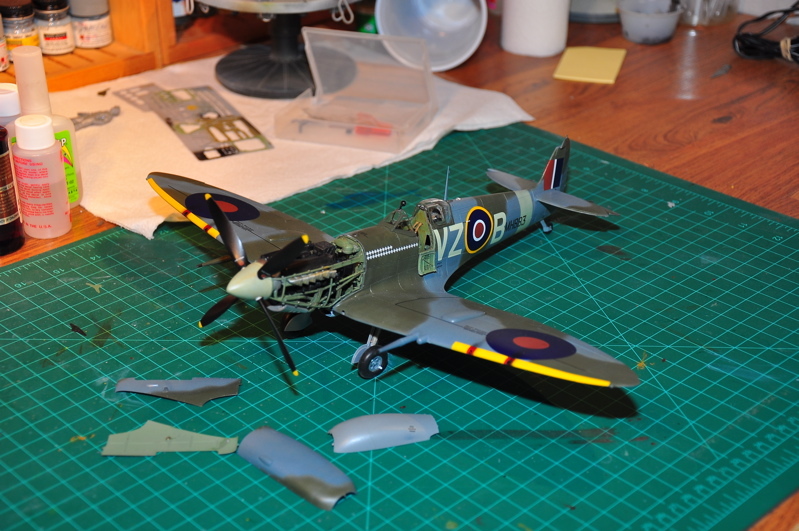 In order to replicate the fine stripes or brackets on the air tanks – I used clear tape (Scotch Tape). 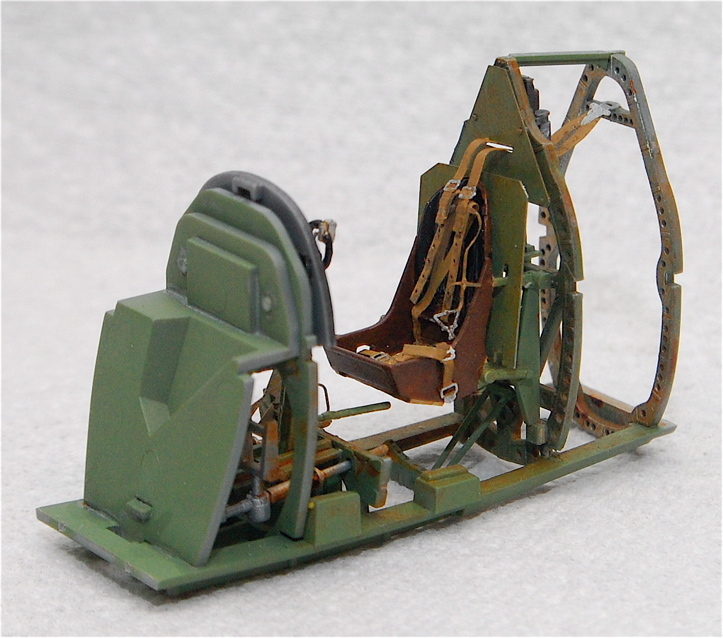 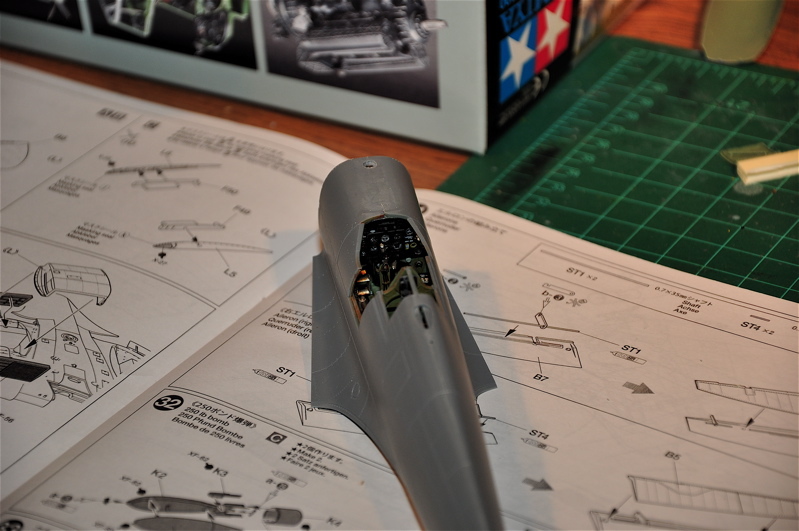 The tape was laid down on the cutting mat then painted Tamiya XF-71 – the cockpit interior green. 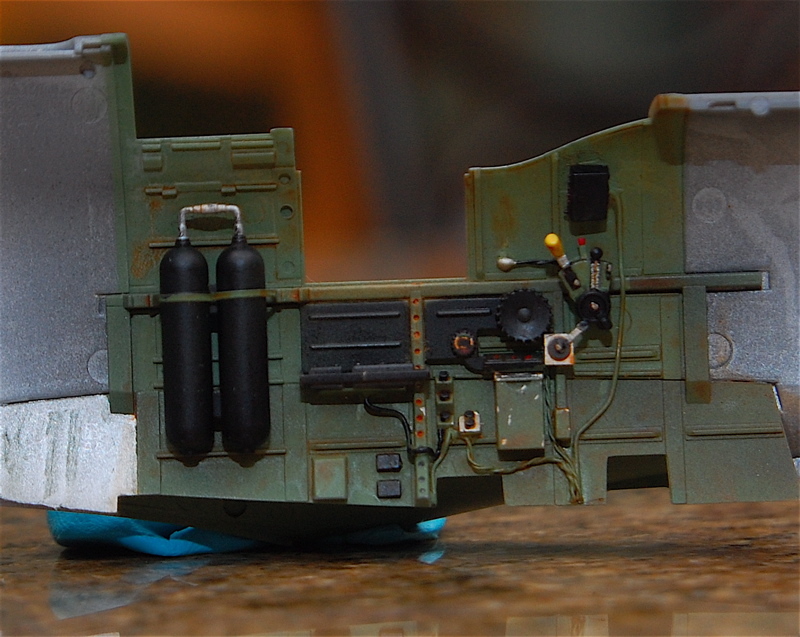 When that was dry I cut some strips of tape using a new X-Acto knife and attached the strips to the pre-painted tanks. 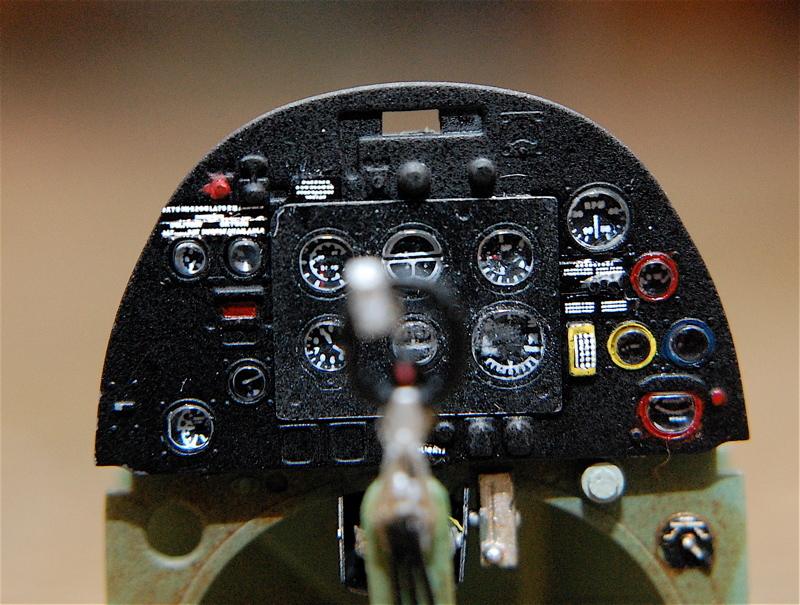 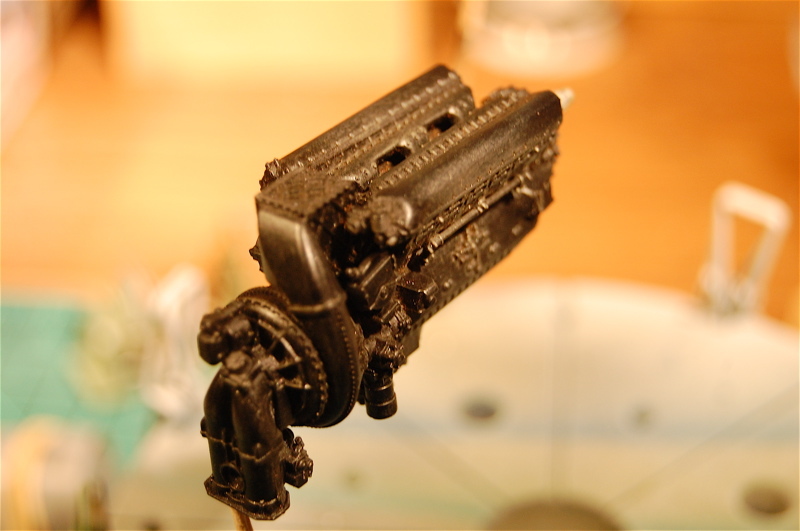 The oxygen hose on the starboard side is a resin part included in the cockpit set. 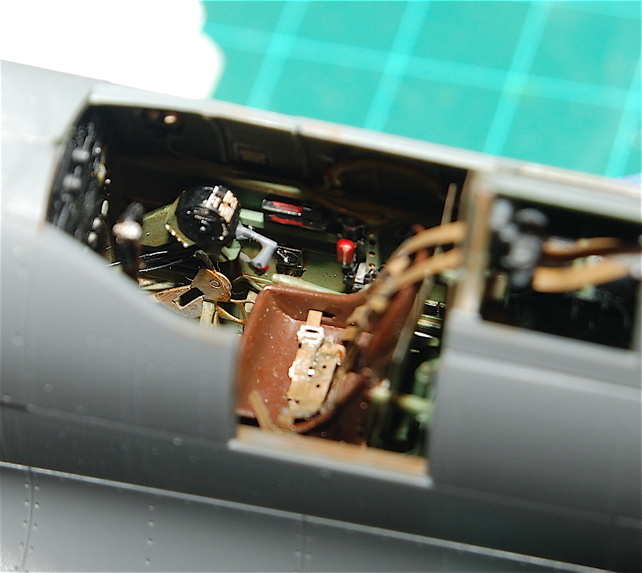 I have also added two pictures of the cockpit with the seatbelts installed. 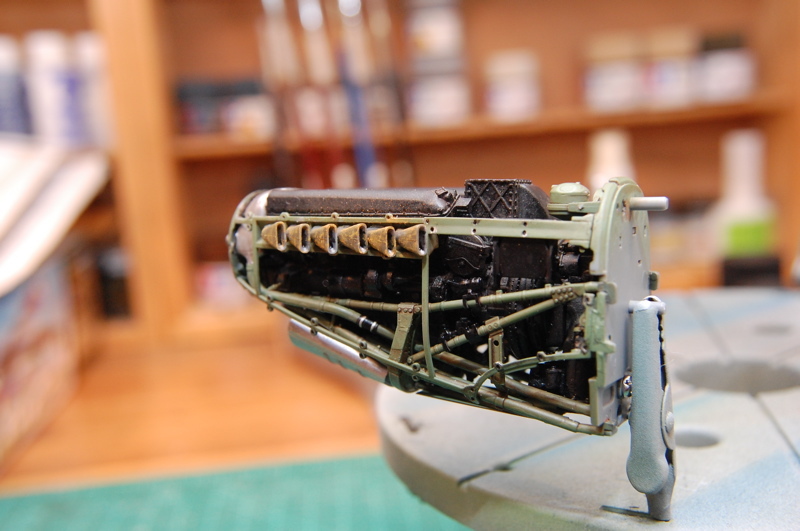 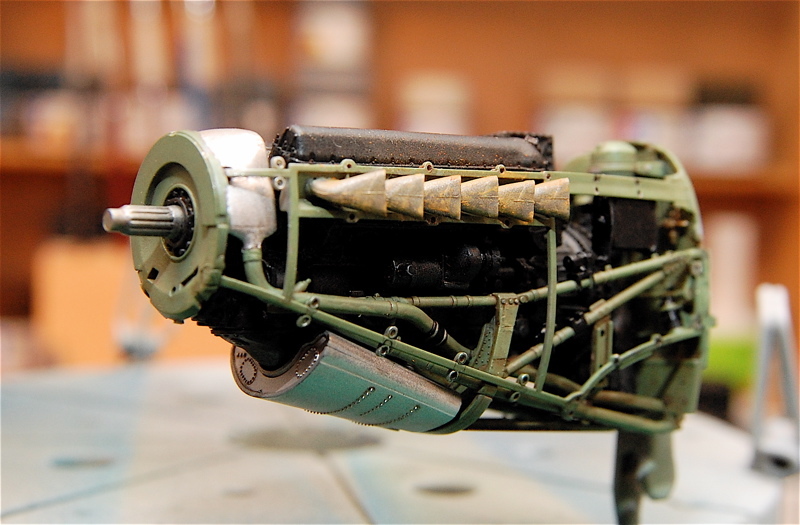 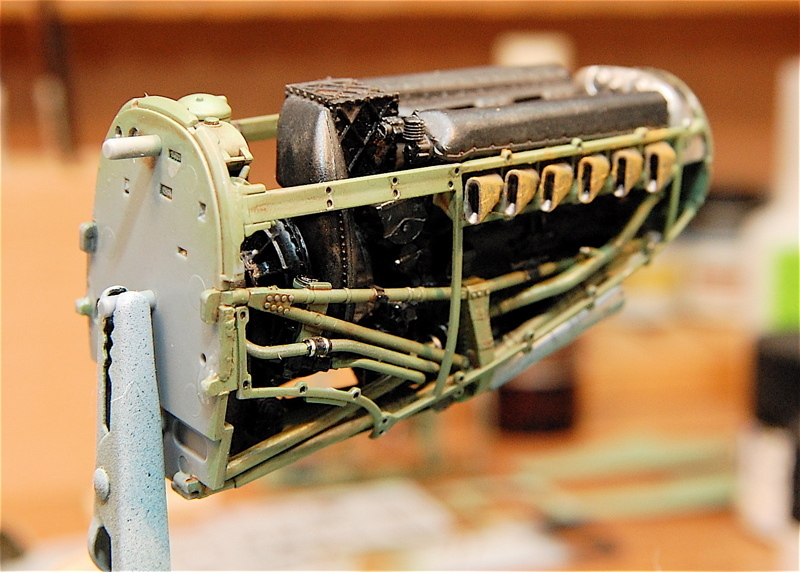 The engine is finished and as the following pictures show – enclosed in the engine framework this is a real gem. 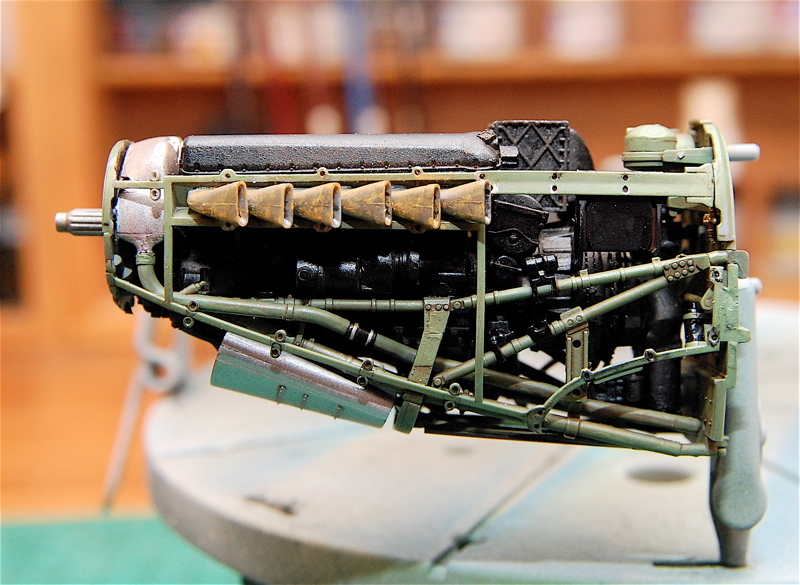 Looking at the picture the exhaust seem a little too rusty so I will be toning that down. 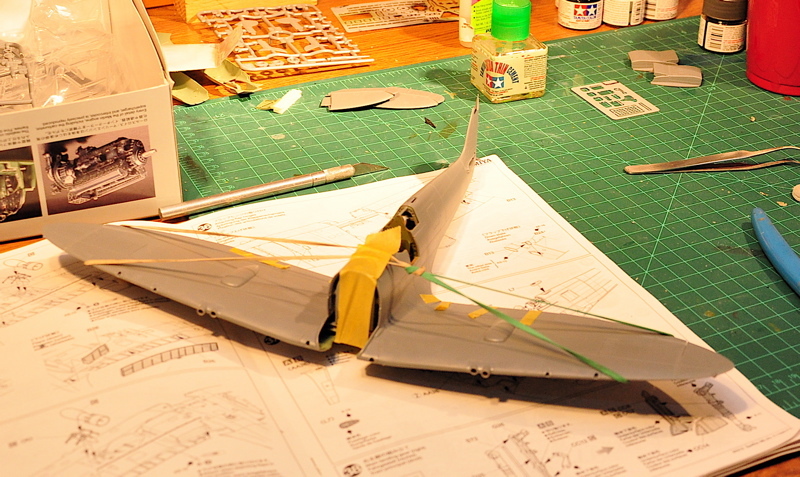 12/31/2010 I've finished the fuselage and the wings. 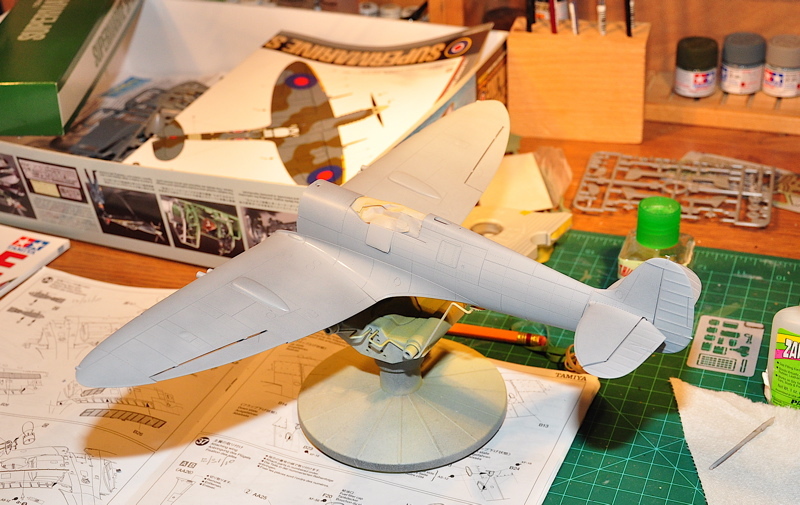 The following pictures show the joining of these two sections as as well as the first coat spray of primer. 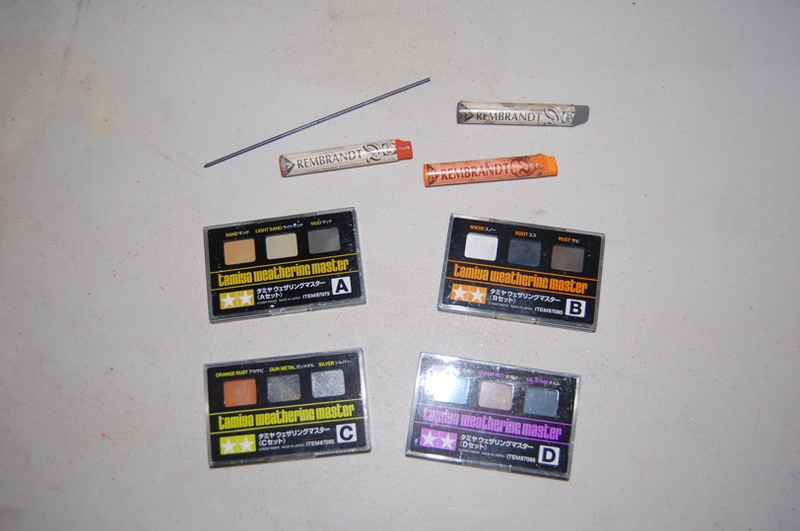 For the first time I'm using Mr Surfacer 1000. 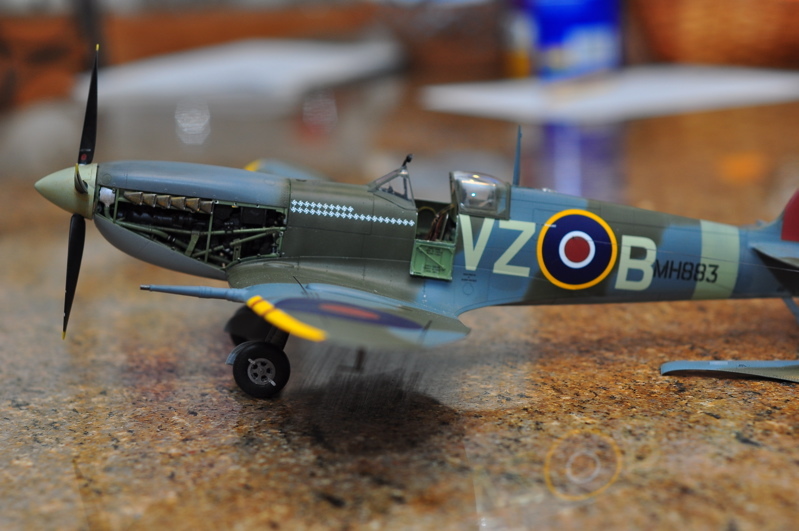 I sprayed it outdoors where the temperature was 52 deg F. It worked pretty good. 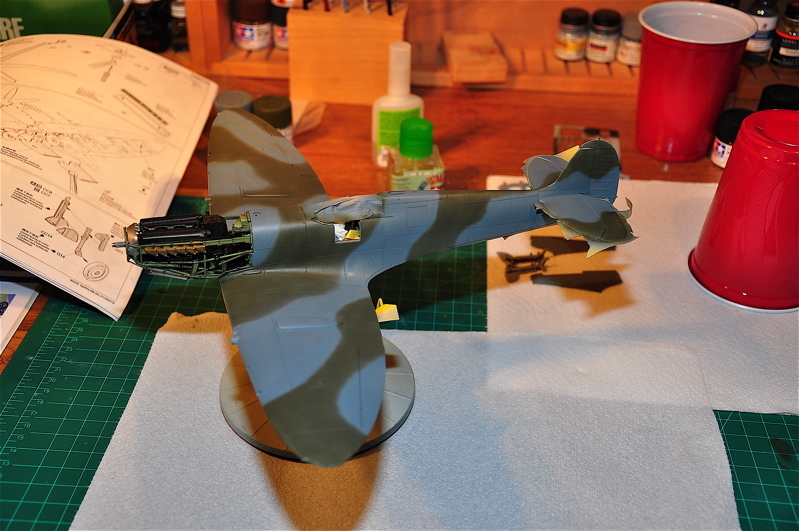 1/23/2011 I've painted the camo. 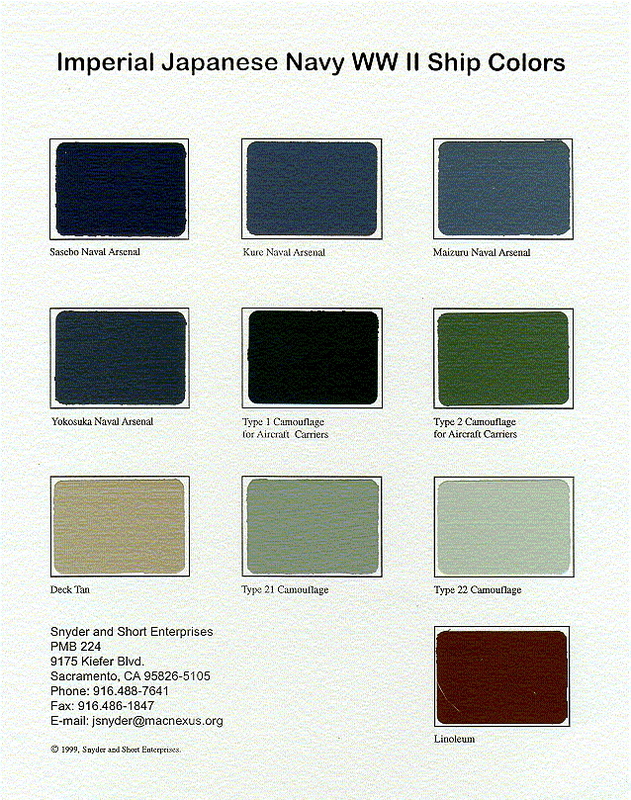 In the first picture you see my first take on this. 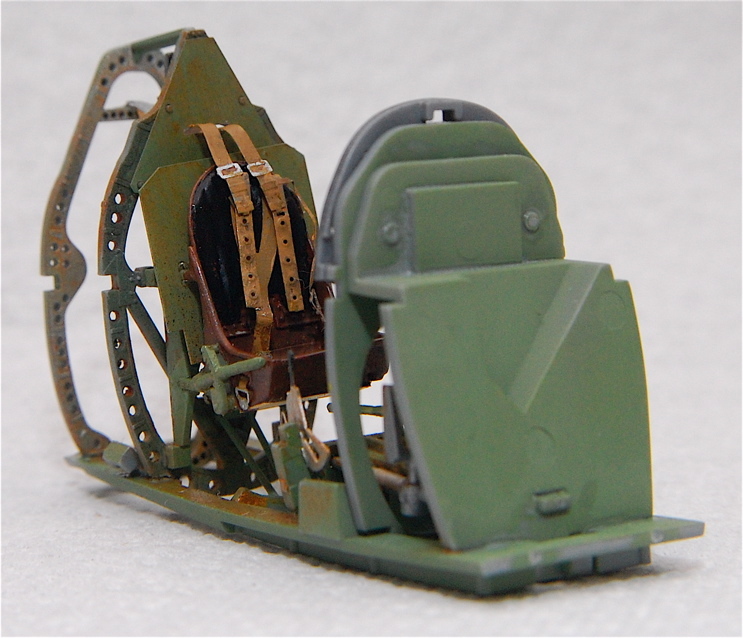 I took the model to the SVSM meeting last Friday and Ben mentioned that the camo demarcation was a little soft – I agreed, so yesterday I redid it and you can see in the following pic that effect. 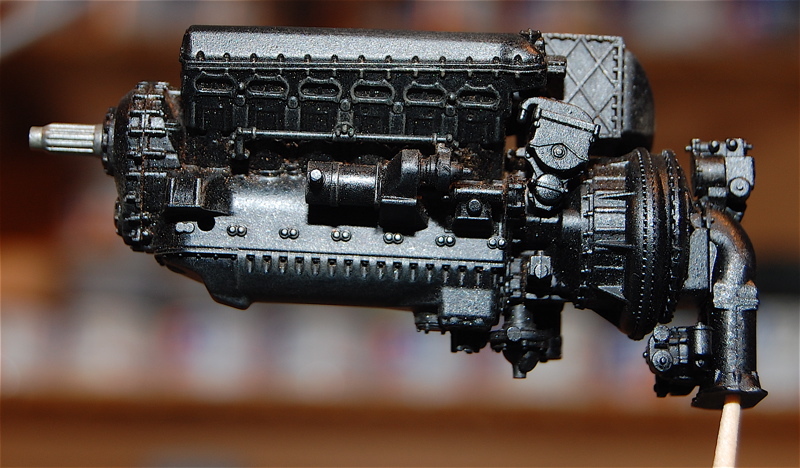 It does look a lot better. 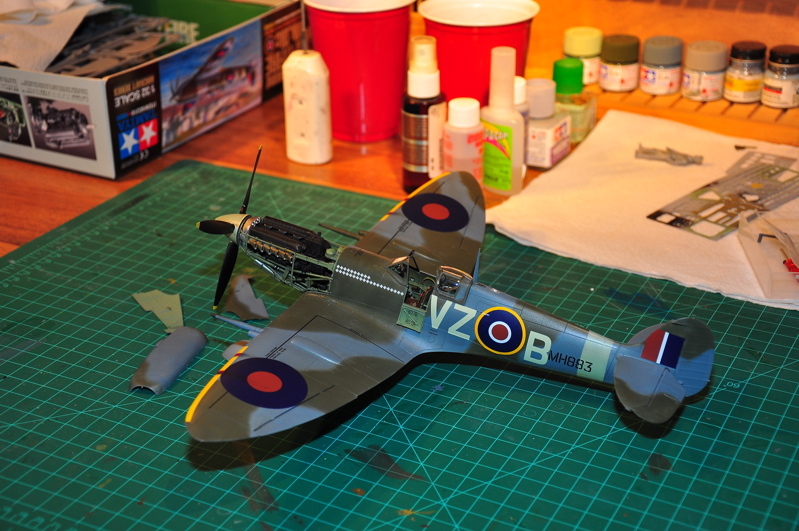 I have also dipped the clear parts in Future Floor Polish to improve the clarity. 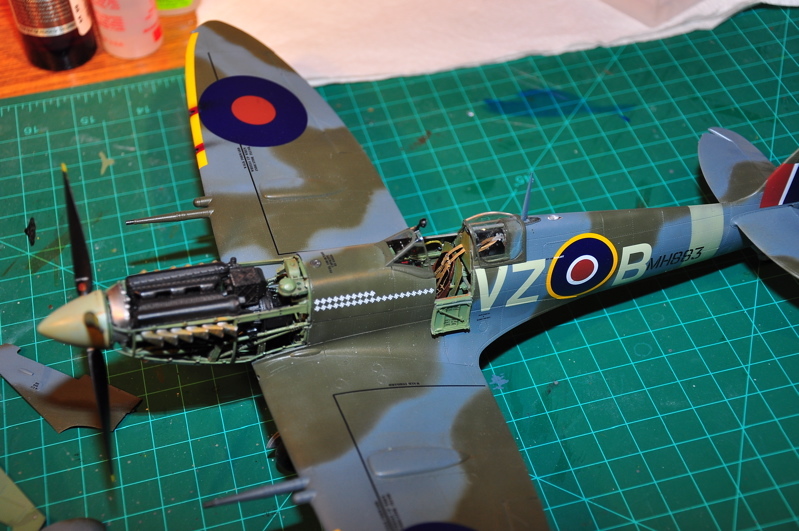 I've also included a pic of the landing gear. 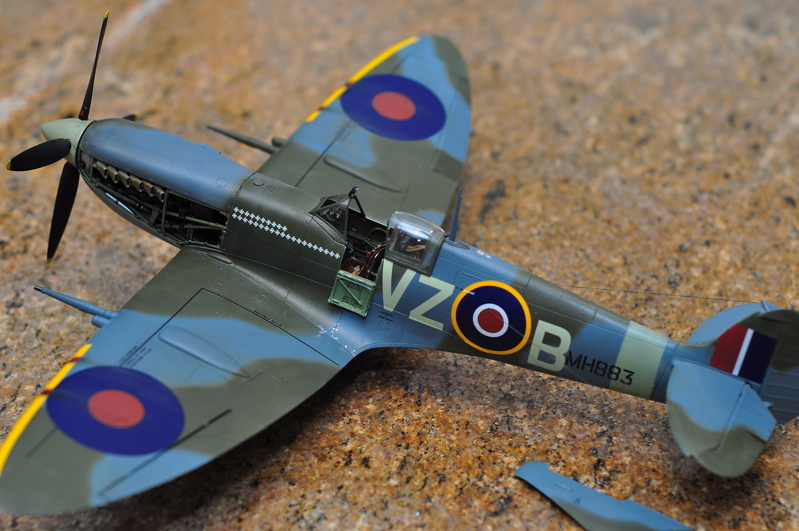 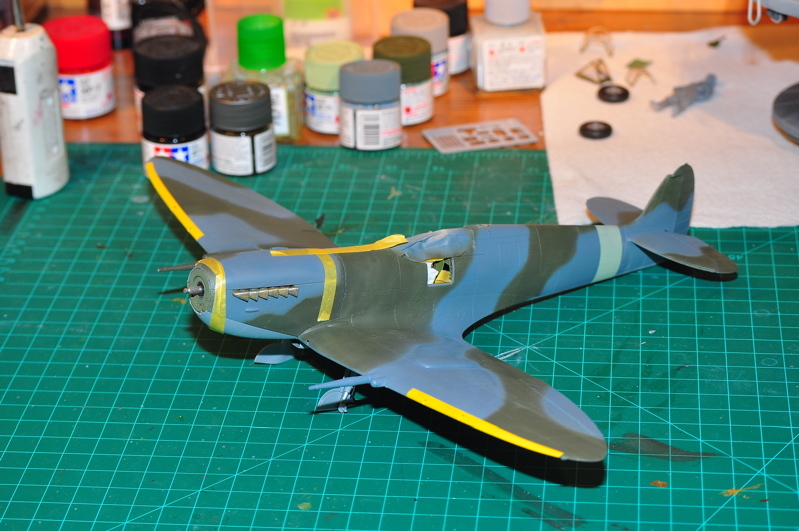 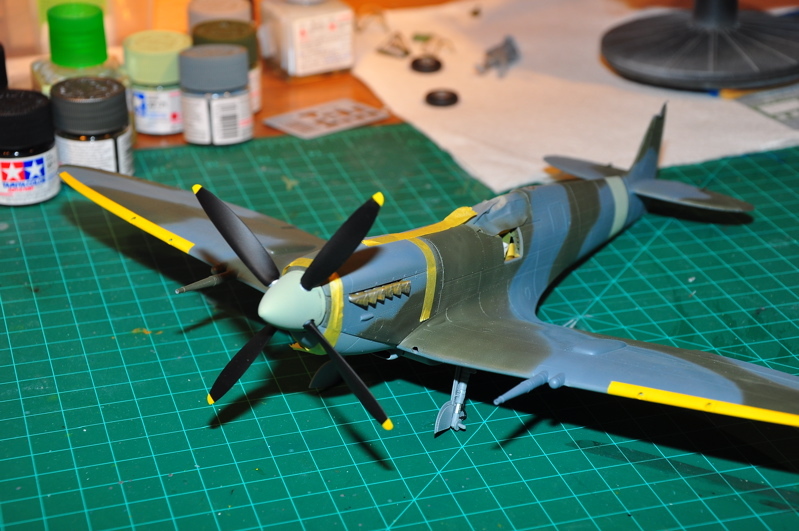 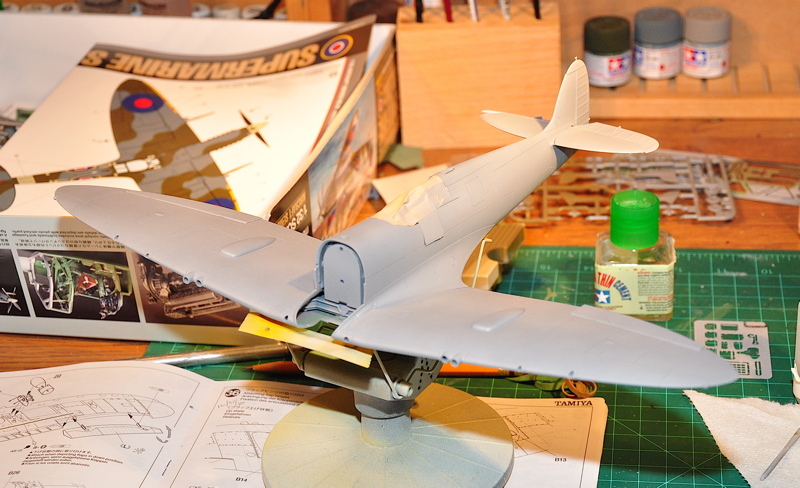 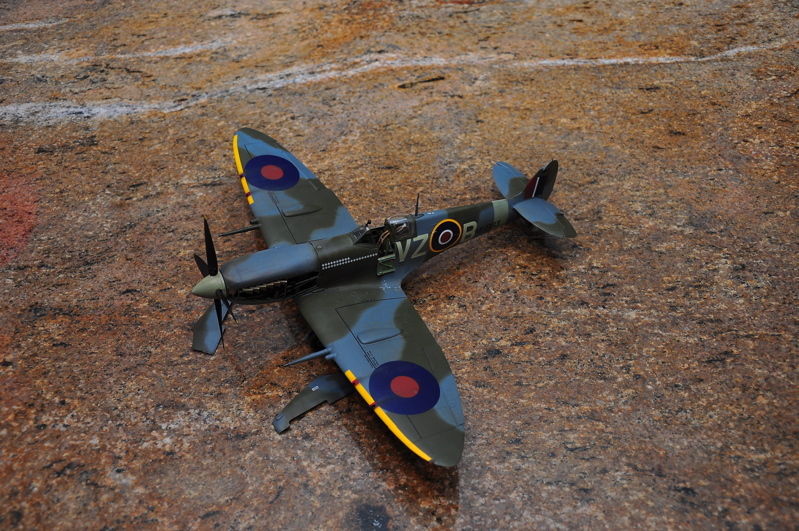 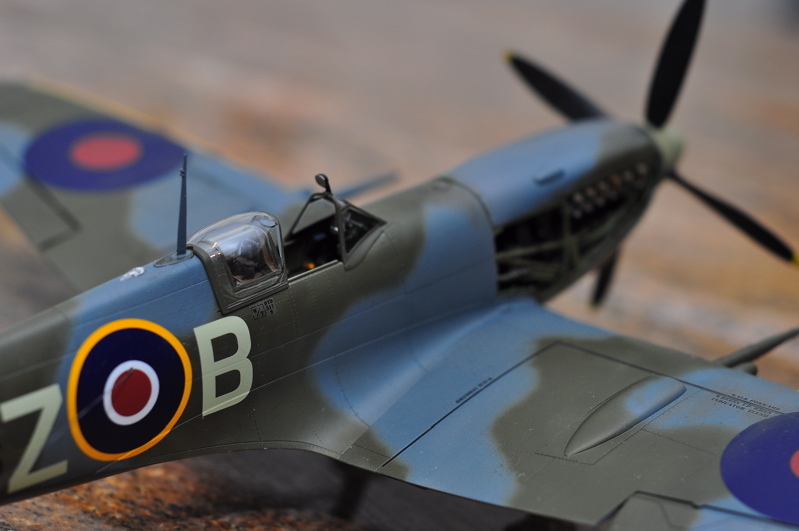 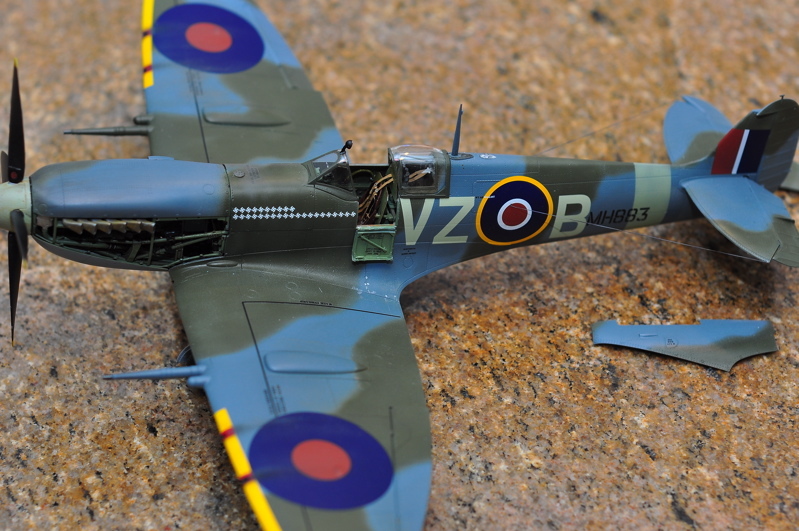 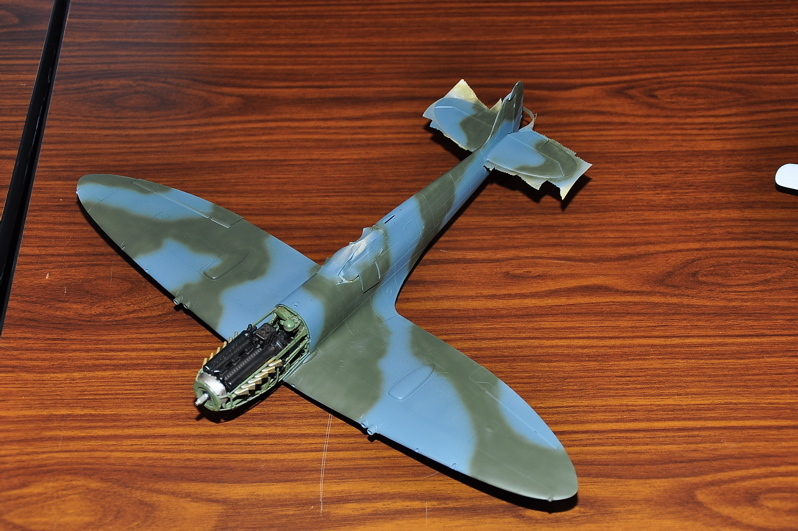 More pics – I've finished the camo added the landing gear and painted the prop.